Family Affair - Covilli Brand Organics, Inc.
Our founders’ work ethic and determination shaped Covilli and the organic community from the very beginning. 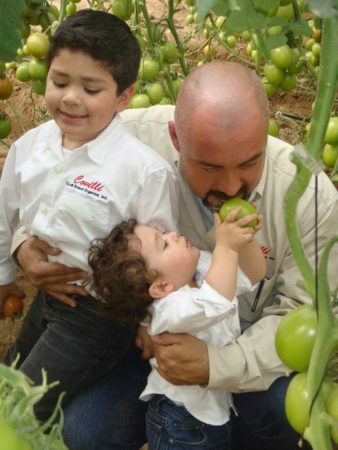 After a tragic crop loss during the second season of Covilli’s existence, Terry’s determination drove the company forward, and took Covilli from Baja California to the Empalme valley of Sonora. At the North most point where you can grow produce during the winter, Covilli set a trend for growers throughout Mexico. Although we were the first to call Empalme valley home, we now share the valley with many other farmers, who have realized the benefits of the fertile Sonoran landscape. Terry’s vision didn’t end with creating the best produce in the world. He also built Covilli to support our community and take care of our workers. In addition to our Organic, and Food Safety certifications, we’re proud to be a Fair Trade farm. That means that all of our workers are paid a fair wage, have access to health care and education for their children, and are able to achieve a better future for themselves and their families. When you buy from Covilli, part of the sale goes directly to the workers, so that they can democratically choose how to better their communities. The vast majority of our workers return to ovilli’s farm year after year. Not because they have to, but because they are part of the Covilli family. As part of our expansion program, aimed at offering more variety in a longer season, we have started partnerships with other Organic growers both in Mexico and the U.S. There is absolute certainty that they offer the same quality and consistency in organic fruits and vegetables that our beloved customers, are used to receiving from us – Covilli Brand Organics. Terry and his cofounders built a socially conscious, responsible, family-owned company, and 25 years later, we’re still working to be the best we can be. We hope you’ll be part of our family for decades to come.